You are currently browsing the tag archive for the ‘jaunting car’ tag. Muckross House in Killarney National Park. We had breakfast at the hotel since it was Sunday, it was early, and NOTHING was going to be moving until 11am. We took a taxi to the airport and rented a car. You know what that means, of course. It means I had to DRIVE in IRELAND. I had been lulled into a false sense of security by Tara who had volunteered to do all the driving before the trip. But we found out Tara is not old enough to drive a rental car yet. So that meant it was all on me. I was so scared. I mean, really scared. But what can you do? I got into the car and figured it out. Tara navigated while I tried to remember what it was like to drive a manual transmission. Tara gave a helpful yelp anytime I was too close to the edge of the left side of the road. 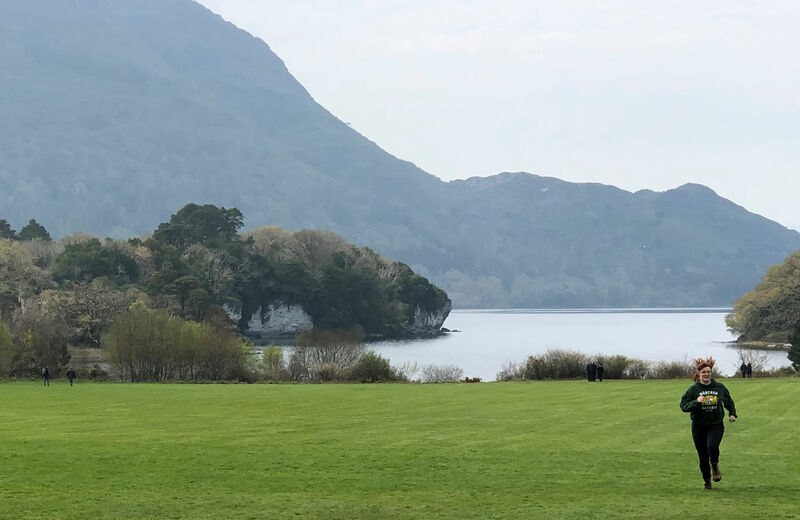 Our first plan was to go to Killarney National Park, check out the Muckross House and find some trails to hike. There isn’t a town at the park entrance, just a congested area with twisty narrow roads and I was clenching the wheel like my life depended on it. But we found an open space to park. As we walked from the carpark we were met by Patrick. Patrick believed that we were in need of a jaunting car. I had seen this on websites but ignored it. Tara, on the other hand, had done more research on this park than me, and had already determined that to make the best of the time ahead, we should hire a horse and buggy. So we did. Can I confess that I was singing this song to myself in my head the whole time? 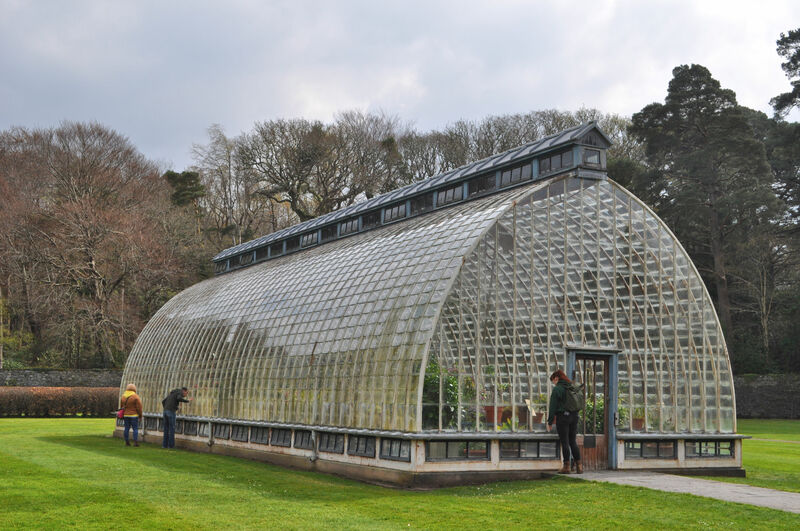 Tara made a beeline for the greenhouse, that turned out to be closed to the public. Tara ran to the shores of the lake because that vast expanse of mowed lawn was irresistible and had to be run across! Then they ran back. Also, there are some wonderful exposed rocks there that needed a closer inspection by my geologist scholar. Nancy was not having one of her better days. 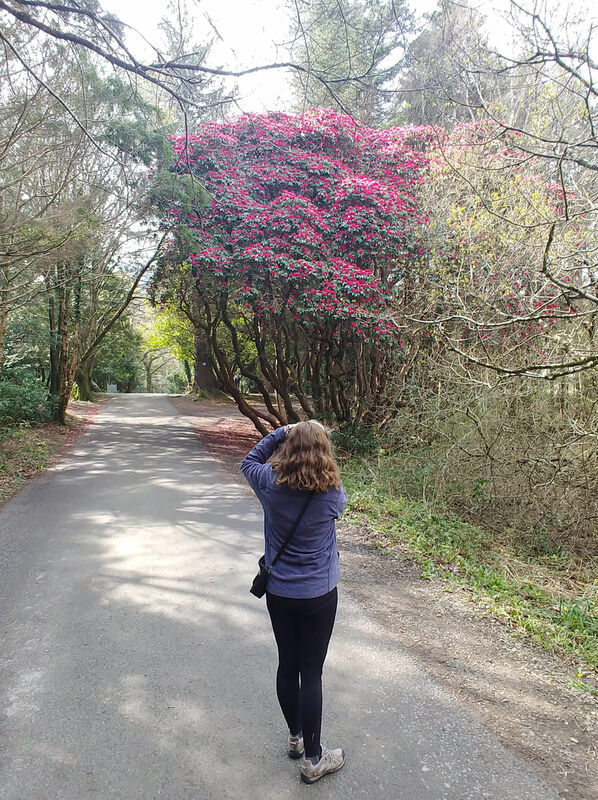 Nancy waited impatiently while I snapped a photo of this magnificent rhododendron. 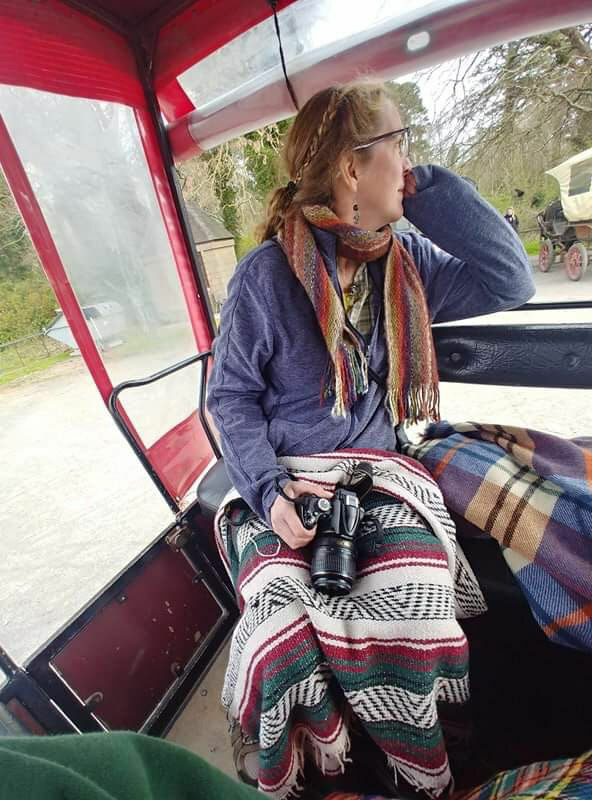 Me under blankets with my trusty camera in the buggy behind Nancy. Patrick introduced us to Nancy, his horse, who was in a pissy irritable mood the whole time but grudgingly pulled the buggy. We didn’t care. 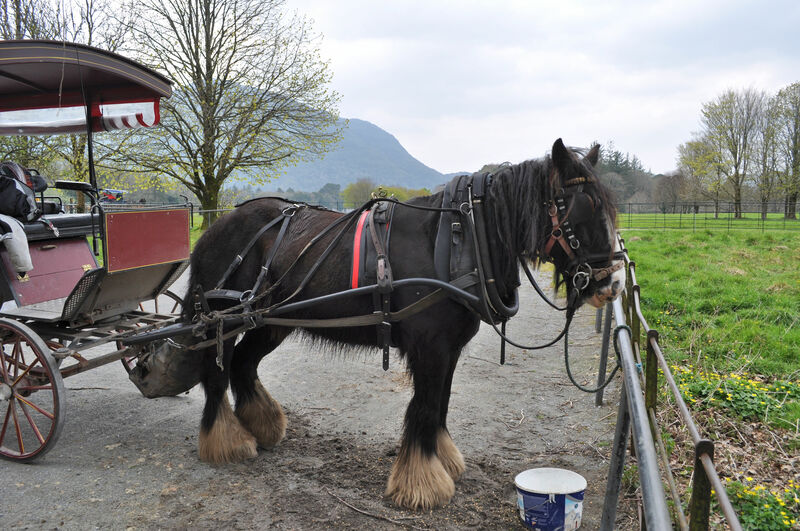 A cranky horse is still a horse pulling a buggy, and it was fun. 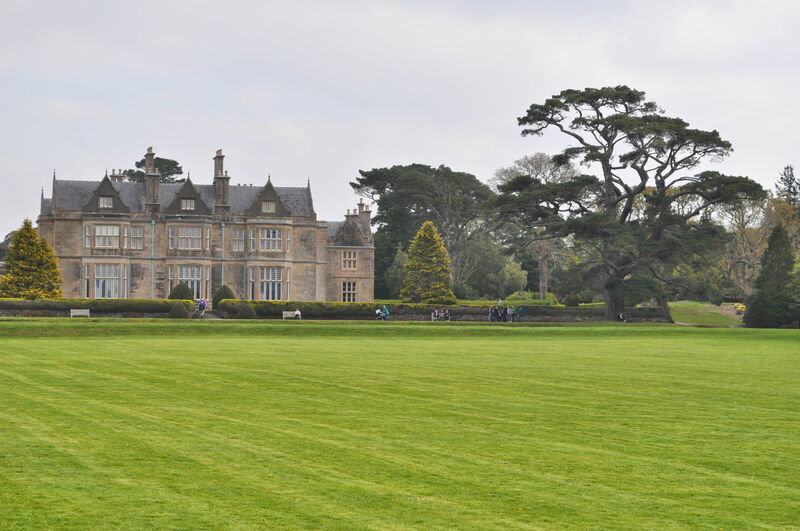 We walked the garden of the Muckross House, pictured at the top. It’s a beautiful place and beautifully maintained. We didn’t go in because it cost money and time and we wanted to spend our time hiking. Walking the gardens was free, however. Tara ran across the wide wide lawn down to the shores of the lake. Then we hopped back into the carriage where Nancy and Patrick took us to what he called an abandoned abbey surrounded by a graveyard. On site it was referred to instead as a friary. 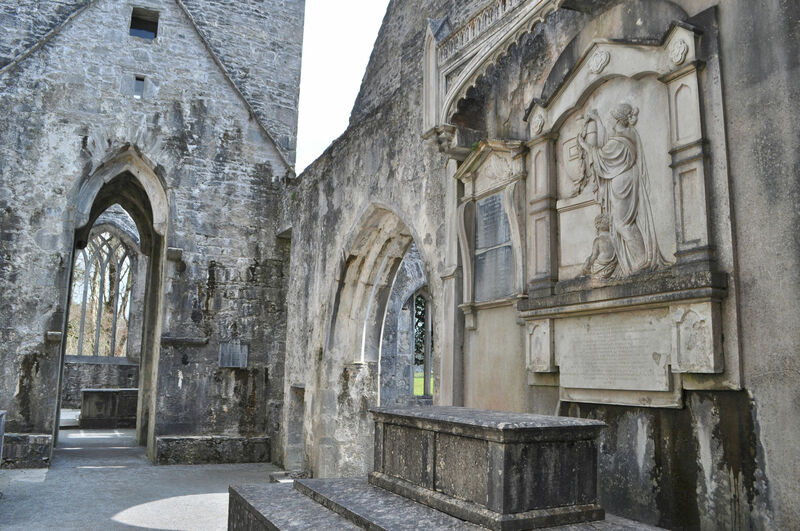 The Muckross Franciscan Friary was probably founded in 1445 by Donal MacCarthy, a local chieftain. 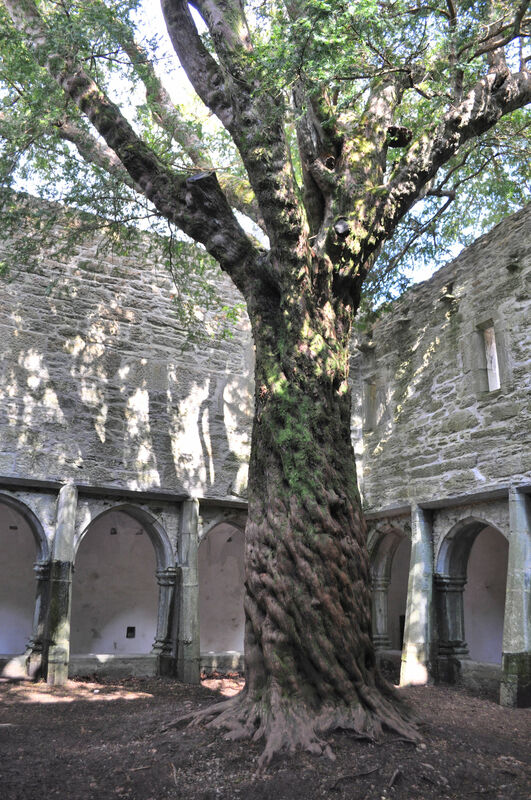 This friary is said to be built around a yew tree inside, which means the tree is 600 years old today. 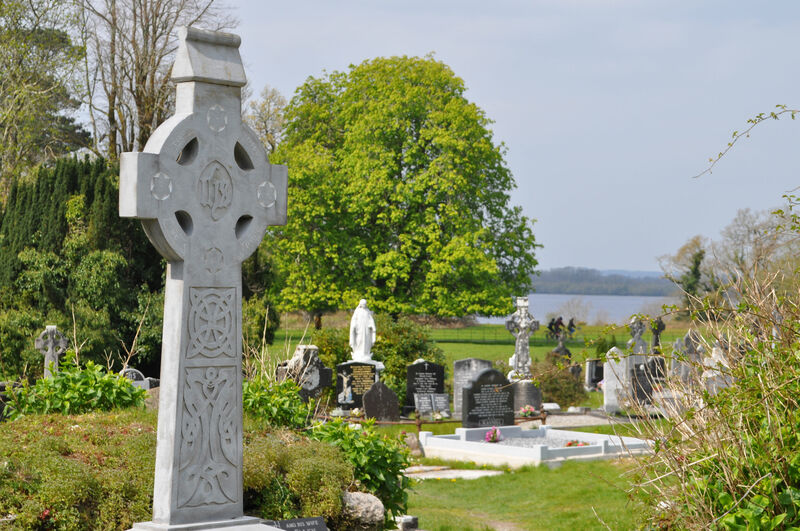 The community here were Observantine Franciscans, so-called because of their rigid observance of rules of diet, clothing, and posession of property. 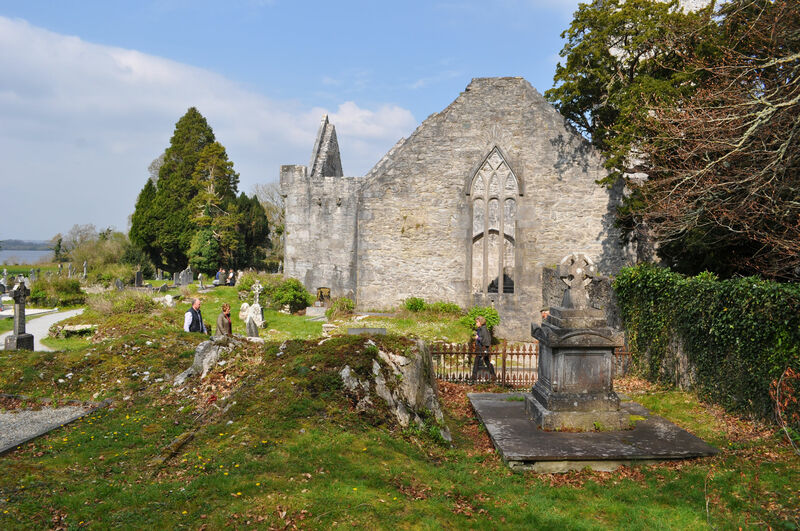 Muckross Friary was said to be in posession of a miraculous statue of the Virgin. 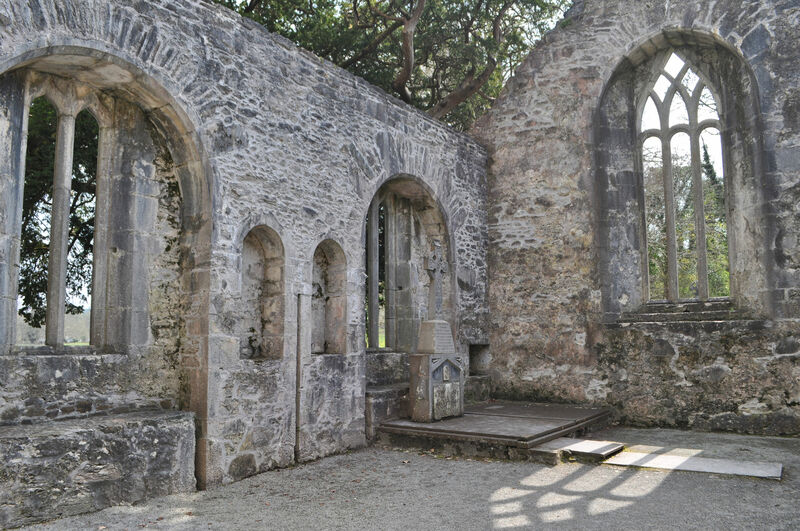 The friars were driven out in 1652 by Cromwellians, and the building destroyed. Enough of the ruins survive today to make it a very educational and compelling stop. Graveyard around the friary, and the park beyond, with cyclists. Interior of the friary and church are still beautiful. Occasional bursts of sunlight made delicious patterns on the ground, bringing life into the rooms. The yew tree inside was remarkable. Next it was time to drive to the trail head and begin a hike. We were both excited to hike near the creek, but we were out of breath because of the elevation gain. 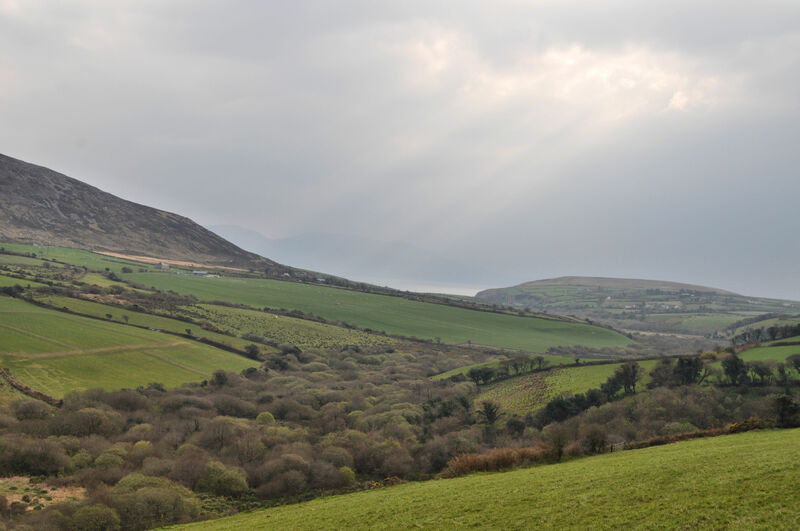 Southwestern Ireland has mountains, and we were climbing for real. But we were quickly rewarded by our arrival at a waterfall. 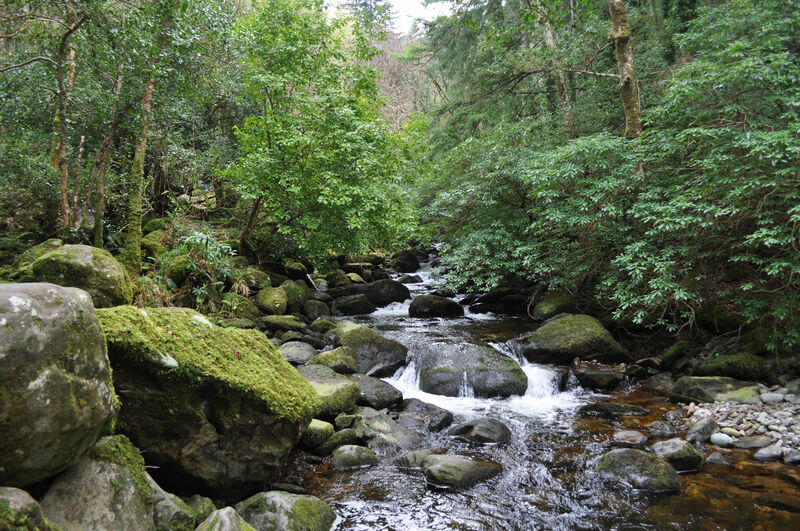 Creek at the trailhead for the Torc Mountain hike. 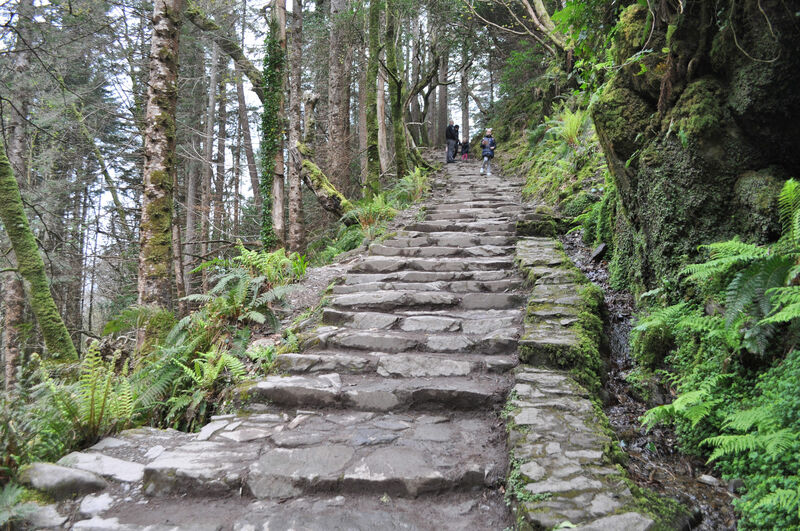 The trail included these fabulous stone steps for the first half mile. 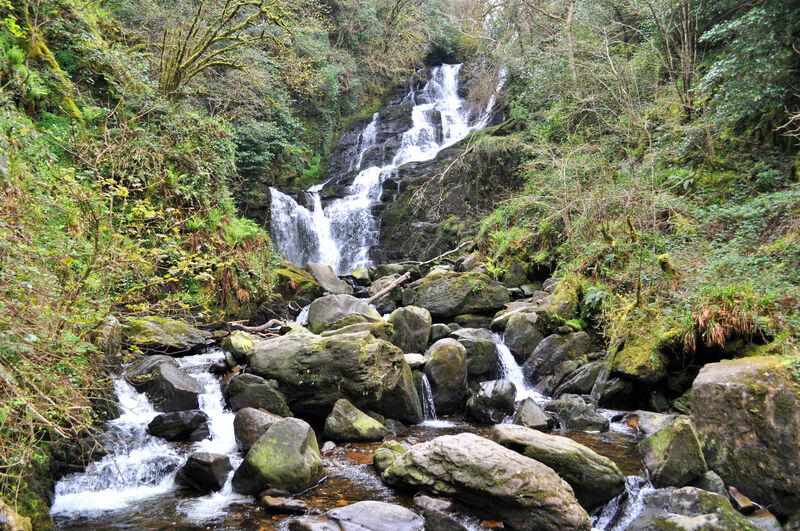 Torc Waterfall of the Owengarriff River. Past the waterfall we continued up the mountain and were afforded some great views of the lakes below and the area surrounding us. We walked through forests, which are not as common in Ireland as we are used to in the Pacific Northwest. 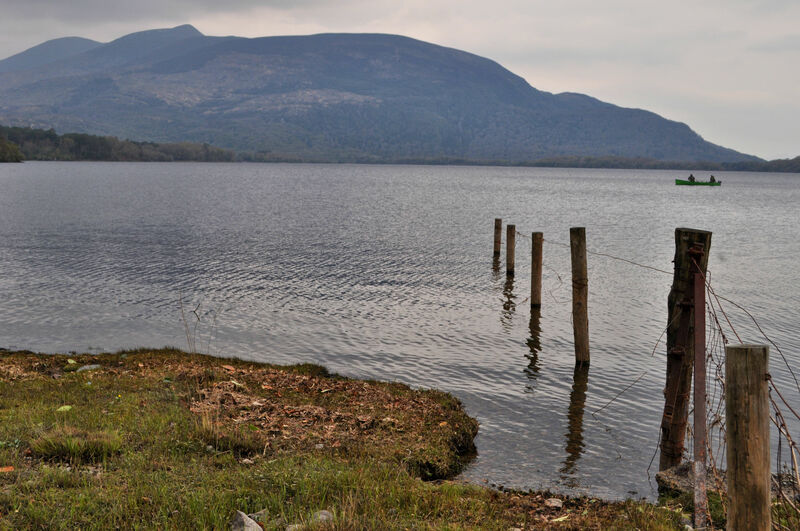 Finally we continued our loop back down the trail to Muckross Lake. We played at the lake for awhile, enjoying the beauty of it. 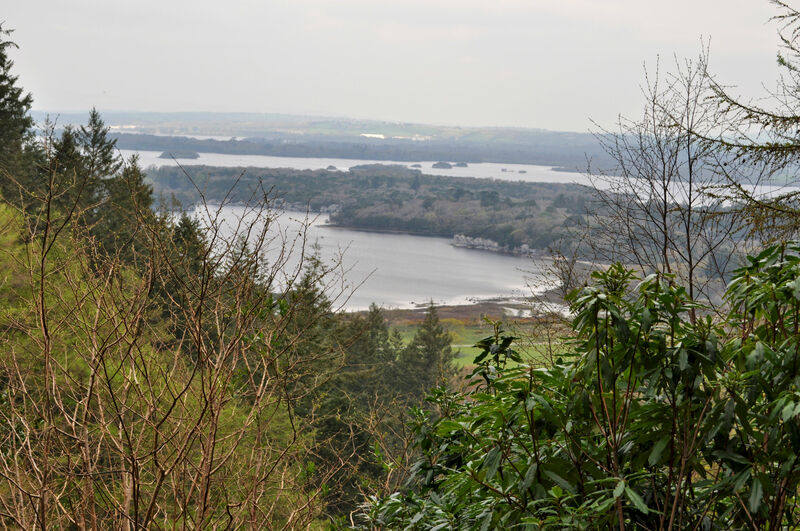 View of Muckross Lake and Lough Leane beyond it. 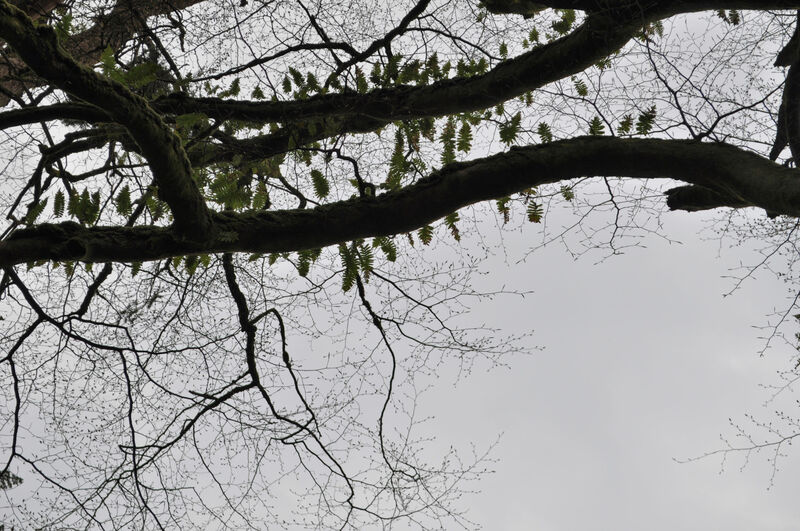 Looking over my head to ferns growing from a tree branch. 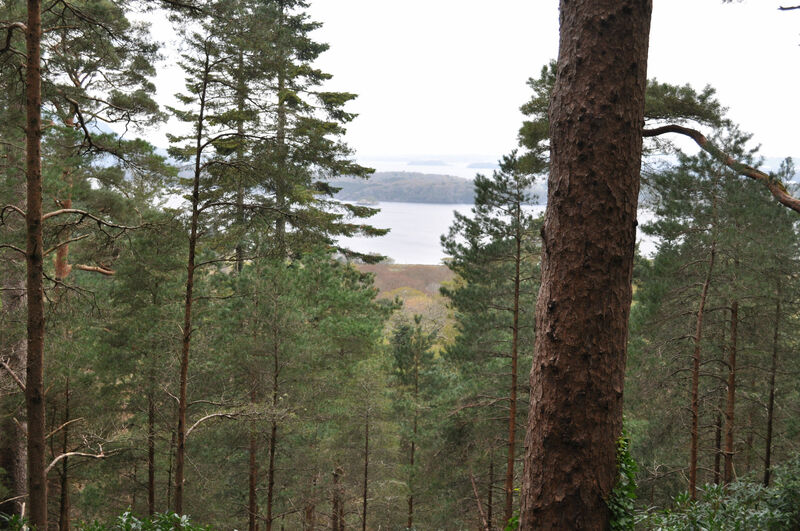 Despite the density of the forest, we continued to find views through the trees. 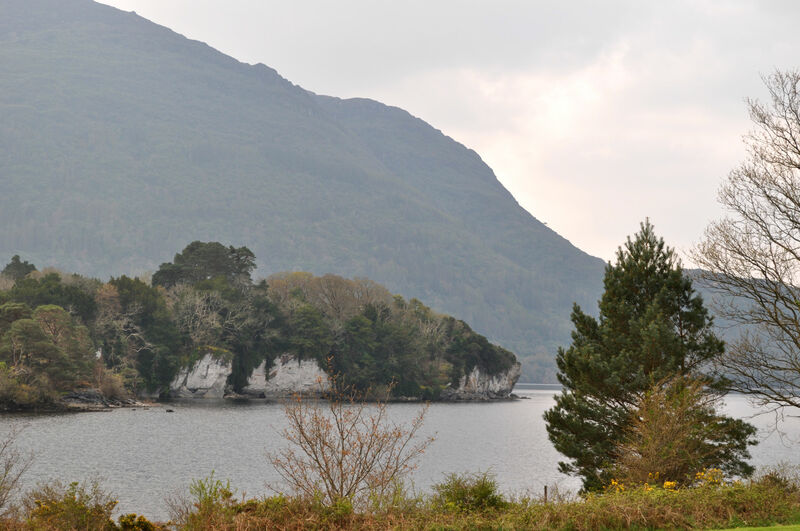 At the shores of Muckross Lake. 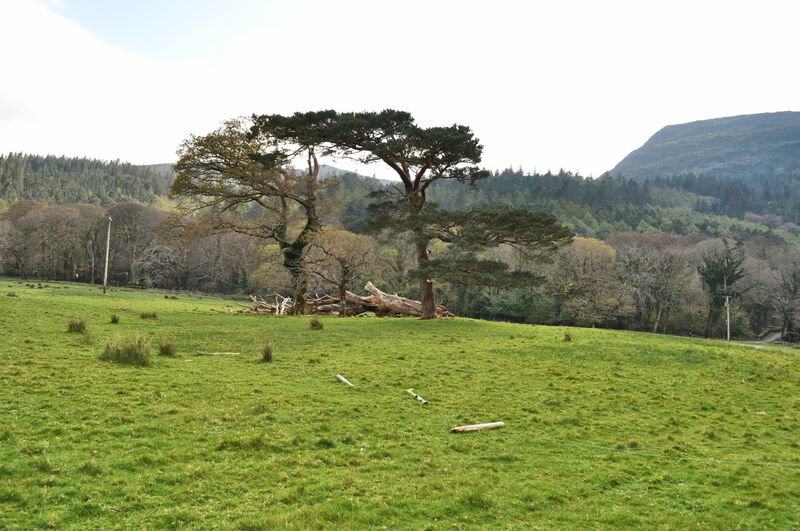 Walking back from taking photos at Muckross Lake. 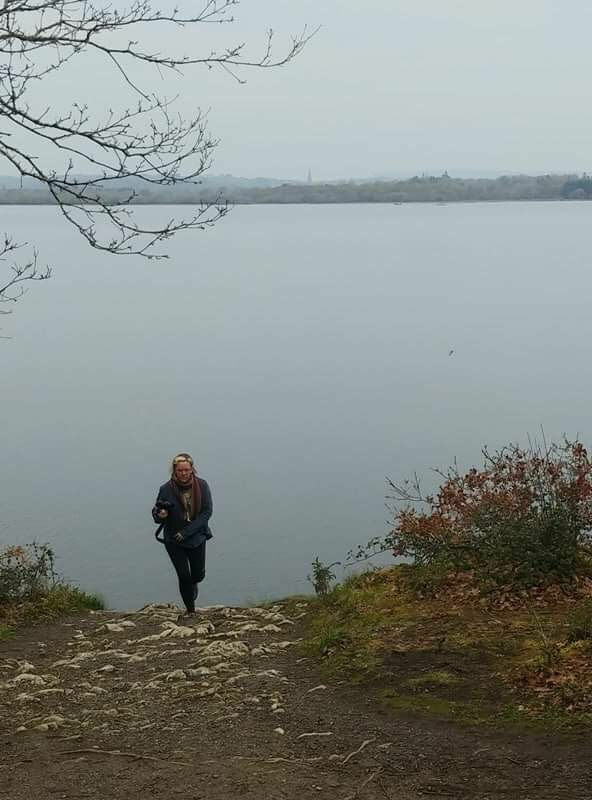 Next we walked the trail that follows the lake back to the carpark where we had miraculously found a parking spot in a tiny carpark for the second time today! 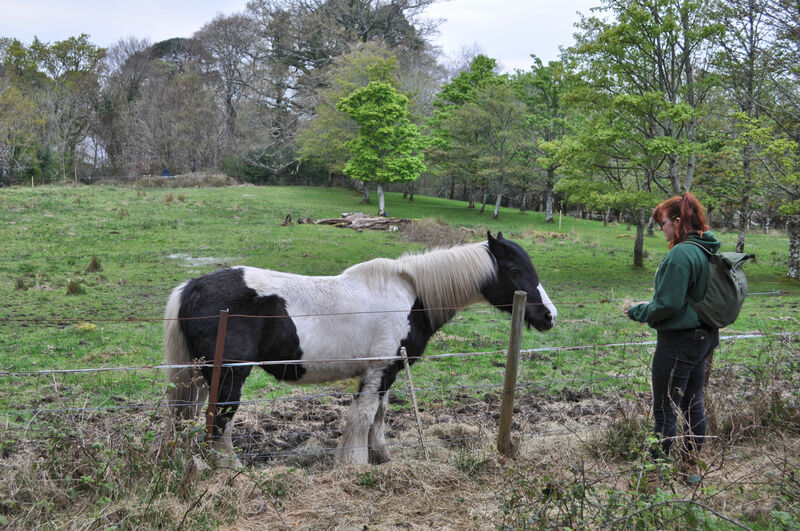 The trail was so lovely that we took our time and enjoyed identifying the plants and birds, and then stopping to chat with a pony having lunch. 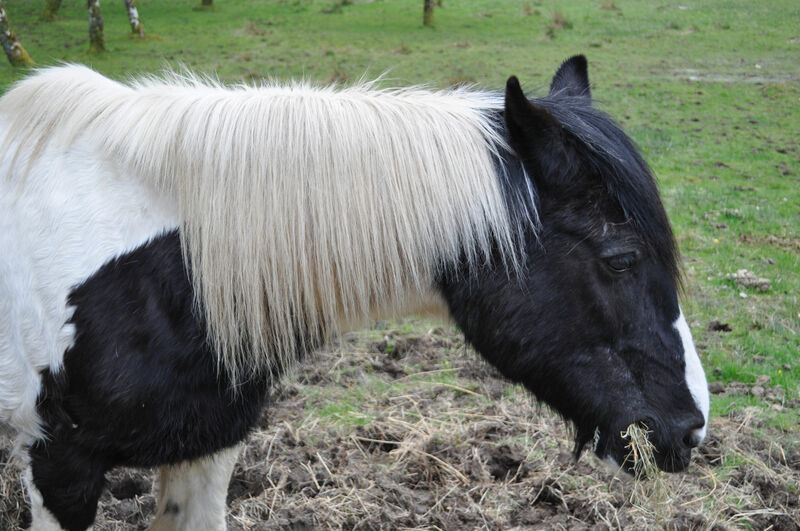 This pretty pony was only somewhat tolerant of our presence, and soon after this photograph turned its head away from us and stayed that way the whole time. Life is hard when you’re so beautiful that people want to invade your personal space. 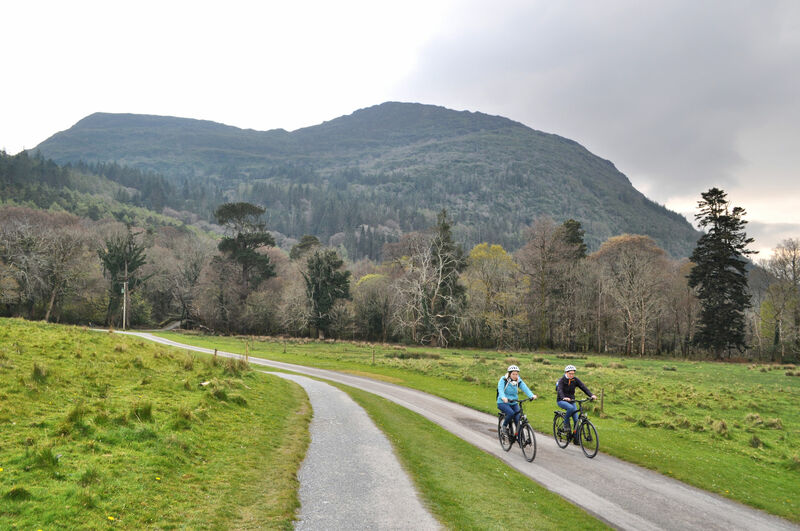 The trail turned into a bike path as we got closer to the back side of the Muckross House gardens, and the lake. Even in the open area along the lake, we were greeted with gorgeous scenery. Satisfied with the hike, we got into the car and hit the road again in earnest. 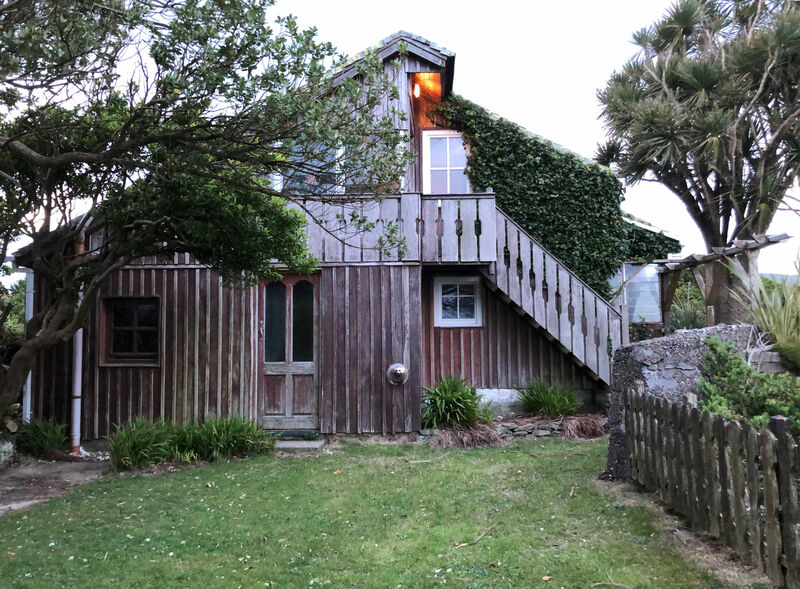 We had used up most of our day and because of the extreme rural site of our evening’s Airbnb room, I wanted to get there in the daylight so we would have an easier time finding the place. 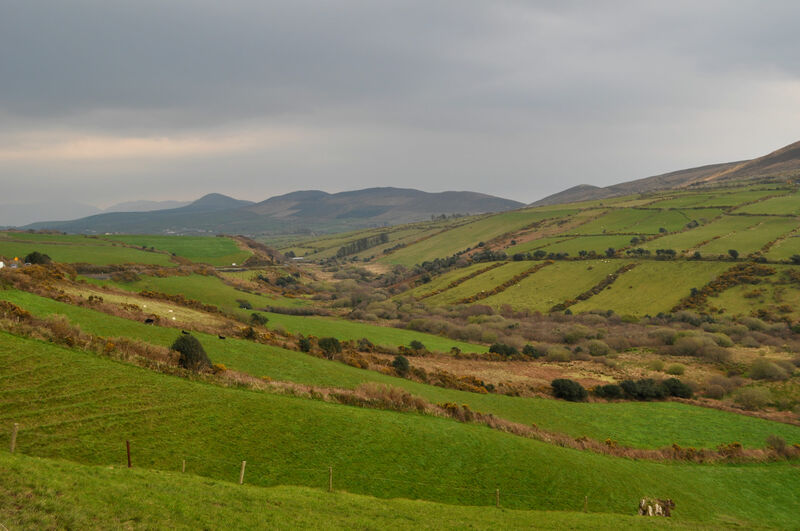 We drove out to Dingle, and past it, on to Ballyferriter. And past that. If you looked at a map, you’d see we were heading almost as far west as it is possible to go on the mainland of Ireland. When we began plans for this trip last summer, Tara had said to me: “Cliffs! Cliffs! Cliffs!” and so I made an effort to find a way to get us out to some cliffs. 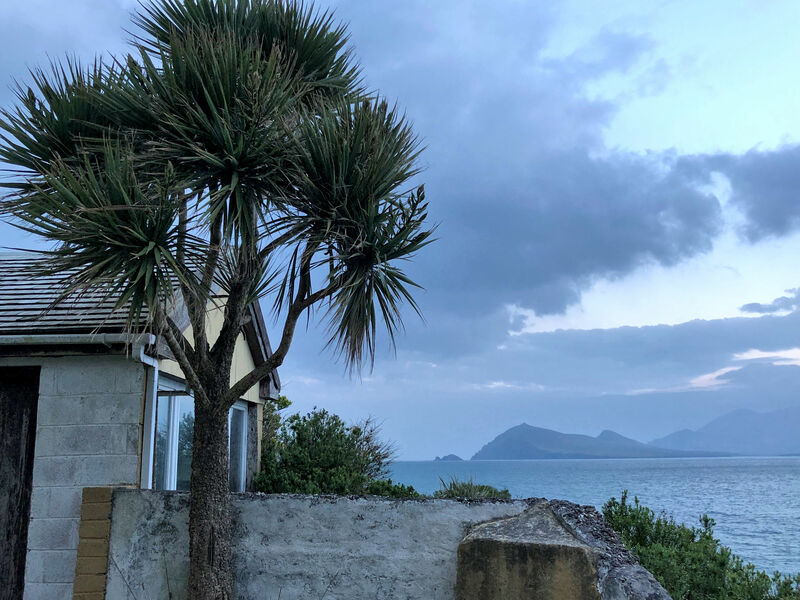 I found an Airbnb room in our price range (which was modest) that was directly ON the cliffs of the Dingle Peninsula. The place was apparently so small we had to share a bed, but it seemed like a good place. 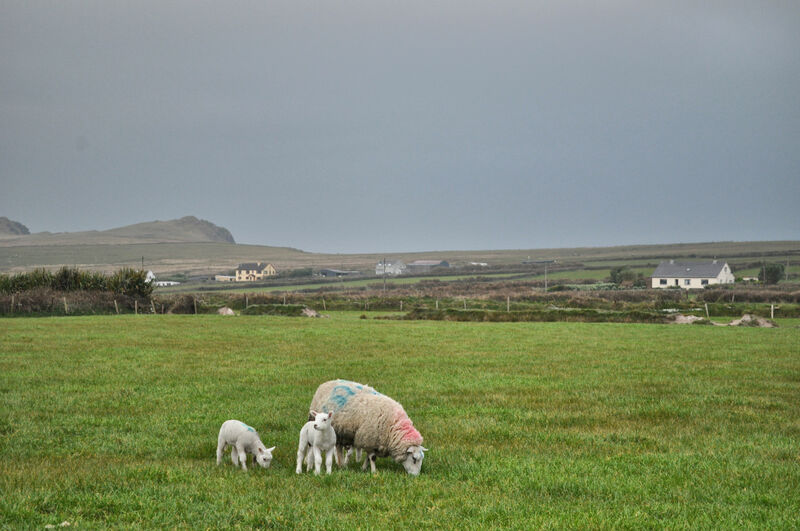 The clouds lifted a little and showed us fairytale scenes of green hills and white sheep. Fields divided by hedges and scattered with sheep. We could see the sea beyond the green slopes. 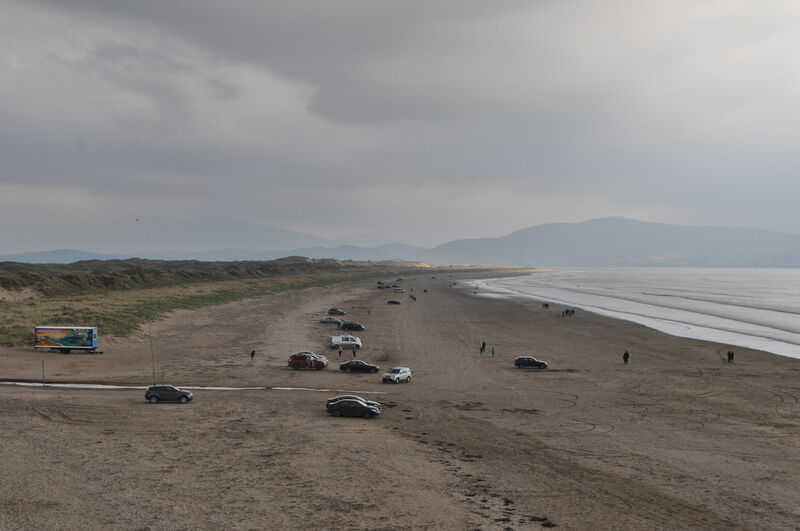 We passed Inch Beach, where cars drove right out there on the sand, like they do in Oregon. 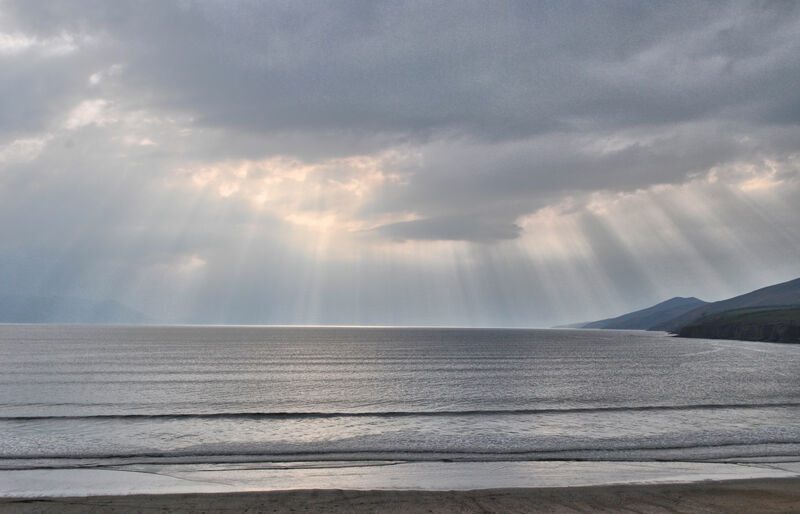 Crepuscular rays splashed across the sky. We went north from Ballyferriter and took a wrong turn and took another wrong turn. Each time ending at the seashore and nowhere near anything like the description of our room for the night. It was frustrating. But one stop was very cool, and if we hadn’t got lost we wouldn’t have seen it. 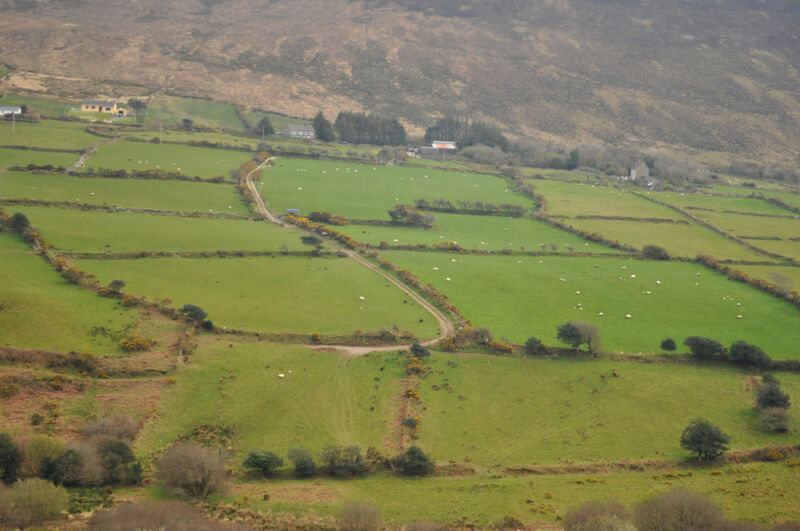 At the end of a narrow dirt road was a site named Dunanoir (Dun an Oir in Irish), meaning Fort of the Gold. Its use as a fort may date to the Iron Age (500 BC to 500 AD), but is notable for the events which took place in 1580 AD. A force of Spanish, Italian, and Irish soldiers, supporters of the Desmond Rebellion, landed in Smerwick Harbor in that year and immediately began to build new fortifications here. Before they completed their work, English government forces led by Lord Grey de Wilton, began a three-day seige. On October 10th defenders surrendered, and up to 600 people including men, women, and children, were massacred on the spot. The commanders were spared, but some have written that theirs was the worse fate. It was demanded that they renounce their Catholic faith, and if they did not, their limbs were all broken. The earthen remains of the unfinished bastions are still evident at the spot, and a monument to recognise the event has been erected. 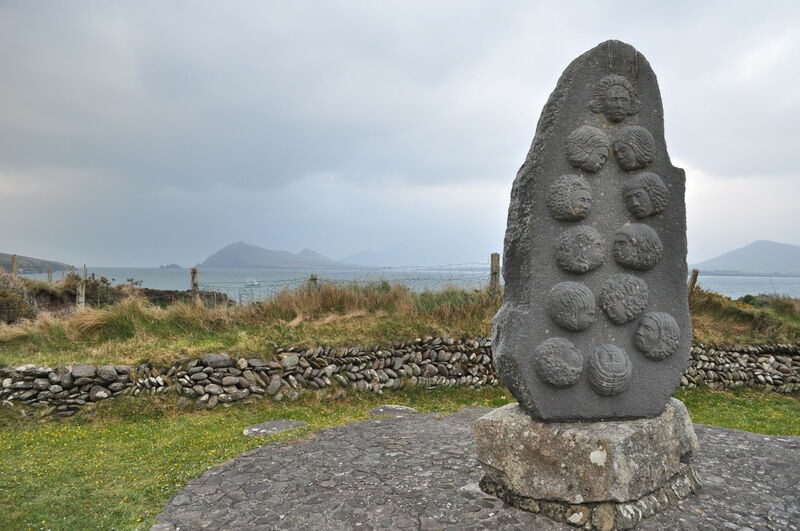 A monument sits at the site of Dunanoir. We also said hello to the sheep before we got back into the car. We drove all the way back to Ballyferriter and tried again. Bear right at the golf course, turn left at the handwritten sign, turn right at the next handwritten sign, down a very long, bumpy, very narrow road in which brambles brushed both sides of the car at once. I was panicking that someone in another car would meet us there, and one of us would have to drive backwards for 200 yards. Finally, we came to a spacious parking area in front of a lovely little house. A kind and smiling older man came out to greet us and asked if I was Crystal. Yes! We had found it. The spot was incredible. Our room was a darling tiny attic cottage with lots of glass windows and a tiny sitting room that looked out over the water. We went to sleep that night listening to the waves of the Atlantic Ocean crashing just beneath us. The stairs lead up to our room. The view from the garden in front of our room.